Prepare the cupcakes: Preheat oven to 350F. Insert liners into a medium cupcake pan. Twist apart 24 sandwich cookies. Place the wafer with filling on it, filling side up, in the bottom of each paper liner. Cut other wafers in half using a sharp knife. Save 24 halves to place in the frosting. Crush the other wafer halves, also for garnishing. Cut the remaining cookies into quarters with a sharp knife (or break apart into chunks). Toss with 2 Tbsp flour and set aside. Make the frosting: Place the cream cheese in the bowl of your mixer. Beat on medium-high until completely smooth, 3-4 minutes. Add the butter and continue to cream until fluffy. Add vanilla extract. Slowly add powdered sugar (1/4 cup at a time) until desired consistency is reached. Assemble the cupcakes: Once cupcakes have cooled completely, frost with cream cheese frosting. 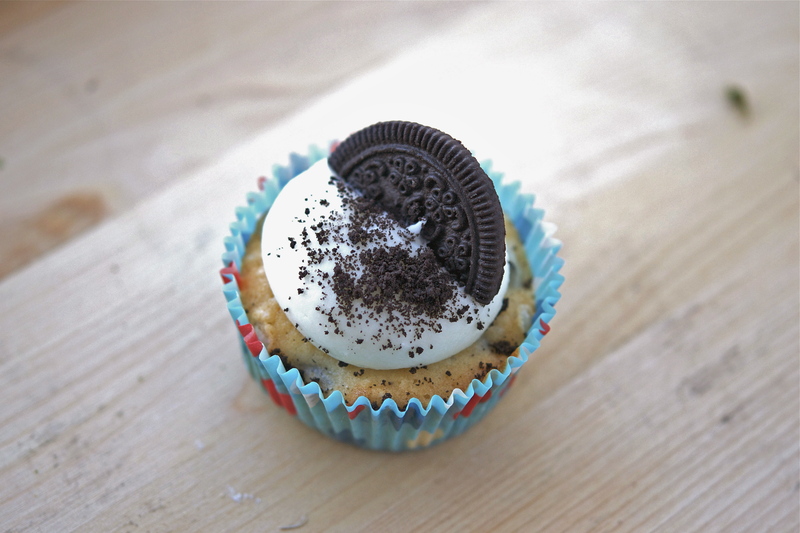 Sprinkle with crushed sandwich cookies and place 1/2 of a cookie on the frosting of each cupcake. To read more about these cupcakes and my musical pairing, click HERE.